Facebook and Twitter are the big guns, the ones everyone knows. And we’ve included them on our list of course. But as we’re finding more and more on Quib.ly, the Q&A community for parents, a vast number of apps from games to photo filter tools carry social elements. Here are 10 social apps your child could be using right now. Kik is currently rated 17+ but it’s well-known that younger teens are using the service regularly. The obvious draws to teens are that it’s free, and can be used by friends across different devices and services. Although messages are private, parents should be aware of the trend of advertising Kik usernames on other social networks. Snapchat is a mobile app for sharing images and videos among friends. The unique selling point however, is also its biggest talking point. Once an image has been viewed by the recipient, it is deleted after a time determined by the sender. For pretty obvious reasons, this has become the service of choice for ‘sexting’. This can not only encourage potentially destructive behaviour but the false sense of security can lead to huge embarrassment. Simply because, with an iPhone at least, it’s possible to take a screenshot of an image before it is deleted ... And even after they’re deleted, it’s possible to claw them back. BBM or BlackBerry Messenger is cited as a fundamental reason for the popularity of what are essentially business phones with a teenage audience. The free service was a huge draw before the days of unlimited texts and remains incredibly popular. So much so that it is now coming to other devices, including iPhones. So get ready for user numbers (already over 55 million) to sky rocket. Rather than usernames, BBM users have a PIN that they choose to give out to ‘trusted’ friends – in theory at least. Similarly to Kik, WhatsApp is a free messaging service that can be used by friends across different devices. Whatsapp users have to register their mobile number and can have group chats as well as one-on-one messaging. If your teenager has friends or family in other countries, WhatsApp provides a free way of staying in touch. As with any group chat, being aware of the potential for cliques and bullying can help you talk to your teenager if they find themselves at the heart of a less than pleasant social experience. Quib.ly e-safety expert, James Diamond has put together some sensible advice about chat apps here. Now owned by Microsoft, Skype has enveloped the Microsoft Messenger that many of us parents will have used in times gone by. While we often use Skype for work purposes, or to videocall far flung family, it’s easy to remember that Skype is also available for smartphones and can be used to video, voice call and chat. Similarly, Google has now combined its various chat and video/voice calling services into one application: Google Hangouts. While Google + is not the most popular social network for teenagers, we shouldn’t discount them picking up this new tool. Loved by many for its gorgeous photo filters, beyond creative camera work, Instagram is also the home of the ‘selfie’. Users tag their image uploads with hashtags which can be used by other members to find collections of similar images. Many of these images are tagged #me or #selfie and can be huge sources of ego boost (‘hundreds of people loved my picture’) but can also attract cruel comments and unpleasant approaches. While many teens may feel tempted to get onto these rollercoaster, the simple act of making their accounts private can help deter. It probably seems almost too obvious to include! 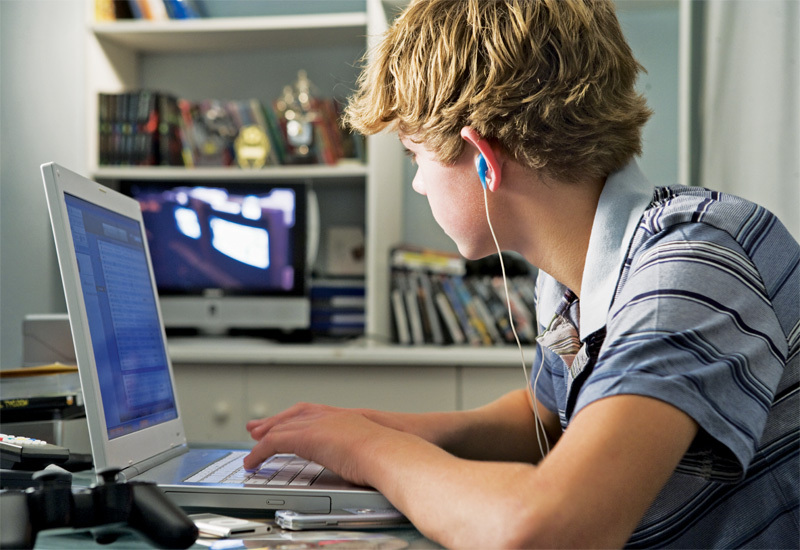 But there are a number of features ‘beyond the wall’ to be aware of and make sure your teen is clued up on. While Quib.ly experts recommend being friends with your teen on Facebook so you can keep an eye on their activity, chat takes place privately, so you will not automatically see who your teen is talking with. Facebook do monitor chat activity for anything really atrocious, but prevention is key. As with any online activity, encourage safe behaviour, only accepting friend requests from real life contacts and telling a trusted adult (ideally you guys) if anything is said over chat that makes your youngster feel uncomfortable. Facebook often gets the limelight but there are millions of under-18s using Twitter. Twitter itself has published a useful guide for parents and alongside encouraging critical thinking and thinking before you tweet (amen to that!) they encourage the use of blocking and ignoring. Often talked about as a blogging platform, Tumblr is actually a social microblogging platform and available as an app and web platform. Now that it’s been bought by Yahoo! expect awareness of Tumblr to rise and – assuming Yahoo! don’t make any missteps with it user numbers to follow upwards. Encourage safe blogging behaviour – no locations or personal information, no contact details – but also the safe social behaviours too. Chances are you’ve heard of most if not all of the apps mentioned so far, except this one. Omegle is far smaller than the others but is perhaps the darkest horse. Omegle’s pitch is ‘talk to strangers’ and while it is for ages 13 and over and users under 18 are recommended to seek parental approval, this is easy to ignore. Quib.ly expert, Rebecca Avery urges caution: "Children are often unaware that webcams etc can be recorded which means that these sites are not as “anonymous” as they may think, so they should always be very cautious when using webcams etc and not do anything on that they wouldn’t do in public. Another of the main concerns with these sites is that they don't record or monitor content, so there is very little chance of the police being able to track anyone who uses the site illegally." However she is also quick to reassure: "[These apps and sites] seem to go in and out of fashion as I've found that young people tend to get bored". Holly Seddon is editor-in-chief of www.quib.ly, a Q&A community for parents to stay up to date with all the challenges and opportunities of our digital world.